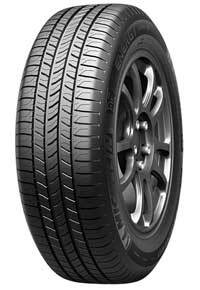 Probably one of the best tires I have rode on, very smooth ride and great in all different weather. For the price they are not worth it. I have under 10k miles and they are ready to be replaced. Straight up not worth the money. Reason I would most likely not buy these tires again is because at around 25k to 30k miles, the 2 front tires are almost completely "bald." The rear tires are "ok" but overall, I think the tread life on these tires is very poor. Excellent tires. The same model that came w/the vehicle. This is a good overall tire. I would expect nothing less from the Michelin Brand. Mileage has improved a small amount. If you're looking for vast improvement, don't look at these tires for that. The ride is a bit stiff, and there is more road noise, but I would probably purchase again. Best tires for summer but so-so in winter but I'll handle it through the bad days in Alaska. Great tire. Would purchase again! I purchased my car 6 months ago and have driven 6000 miles on these tires, including in snow. I love the tires. They are quiet, smooth and have excellent traction. They have 31000 miles on them now and still have excellent tread. Michelin tires are definitely worth the extra $$$. I am in desperate need of tires!! I am in desperate need of new tires, and would really appreciate winning the new tires. Thanks for the professional response and courtesy given to me and my car on our first visit. I really liked how much longer these tires seemed to last versus other brands.